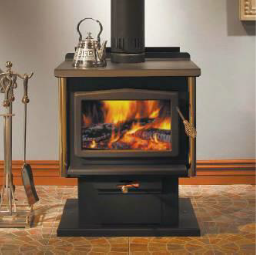 Many people use wood burning as a primary or supplemental heat source for their homes. A growing trend is to burn wood in yards for recreational reasons. Firepits and chimeneas have become increasingly popular. Another source of wood smoke comes from outdoor wood boilers used to heat hot water that in turn heats the home, swimming pools, greenhouses, etc. Wood is a renewable energy source, however, burning wood can impact public health and welfare. USEPA has a website dedicated to promoting the importance of burning the right wood, the right way, in the right appliance at: https://www.epa.gov/burnwise. The more efficiently you burn wood (e.g., using an EPA-certified wood stove and dry, seasoned wood) the less smoke is created. The smoke from wood burning is made up of a complex mixture of gases and fine particles (also called particle pollution, particulate matter, or PM). In addition to particle pollution, wood smoke contains several toxic air pollutants including: benzene, formaldehyde, acrolein and polycyclic aromatic hydrocarbons (PAHs). The biggest health threat from smoke is from fine particles, also called fine particulate matter or PM2.5. These microscopic particles can get into your eyes and respiratory system, where they may cause burning eyes, runny nose, and illnesses, such as bronchitis. Fine particles can make asthma symptoms worse and trigger asthma attacks. Fine particles can also trigger heart attacks, stroke, irregular heart rhythms, and heart failure, especially in people who are already at risk for these conditions. Wood smoke can affect everyone, but children, teenagers, older adults, people with lung disease, including asthma and COPD or people with heart diseases are the most vulnerable. Research indicates that obesity or diabetes may also increase risk. New or expectant mothers may also want to take precautions to protect the health of their babies, because some studies indicate they may be at increased risk. 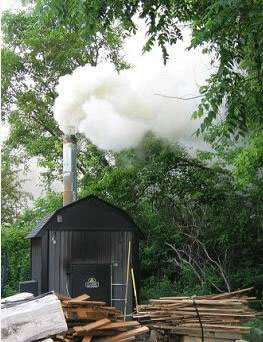 Additional information regarding the health impacts of woodsmoke can be found at USEPA’s website at: https://www.epa.gov/burnwise/wood-smoke-and-your-health. Smoke and odor from wood burning can also be a public nuisance. Wood smoke also emits carbon dioxide (CO2), a greenhouse gas that contributes to global warming, and volatile organic compounds and nitrogen oxides, which form ozone during the ozone season. For additional information and guidance on woodburning health and practices see the links shown below. Outdoor wood heaters (or boilers) (OWBs) burn wood to heat liquid (water or water-antifreeze) that is piped to provide heat and hot water to occupied buildings such as homes. If an OWB violates the Public Health Nuisance Code of New Jersey, N.J.S.A. 63:3-69.1 to 26:3-69.6 or N.J.A.C. 7:27 Subchapter 3 or 5, then the owner may get cited for a violation. In accordance with N.J.A.C.7:27 Subchapter 3, no visible smoke emissions are allowed from any indirect heat exchanger longer than 3 minutes in any consecutive 30 minutes. Complaints should be directed to your local county or township health agency. An NJDEP compliance and enforcement advisory on OWBs with additional information can be found at https://www.nj.gov/dep/enforcement/advisories/2008-05.pdf. Some local ordinances have been passed specific to outdoor wood heaters in New Jersey. The following list is for informational purposes only and does not necessarily represent all of the local ordinances that exist. Be sure to check with your local officials regarding residential wood burning regulations in your town. Consider all the facts before purchasing an Outdoor Wood Boiler. Additional information can be found at the links below.